The Homer Laughlin 451332 Fiesta soup bowl is 9 inches in diameter and has a capacity of 131⁄4 ounces. This size is perfect for lunch portions and ideal for serving pasta, salad, soup, and more. Constructed of china, the dish is heavy duty for commercial use and will not easily chip or scratch. The bowl can be cleaned in the dishwasher and heated in the microwave and oven. 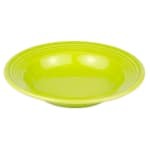 The Homer Laughlin 451332 Fiesta soup bowl will make your tabletop more inviting with its lemongrass color.